Albanian American Development Foundation (AADF) has established the prestigious Masters & Internships Program (MIP) to provide to Albanian young professionals, future leaders and managers a unique opportunity for professional internships and master degrees in the fields of Education Studies, Education Leadership and Management, ICT and Innovation, Project Management, Entrepreneurship, Business and Management Studies, Cultural Tourism and Eco-Tourism. Furthering the mission of AADF – to facilitate the development of a sustainable economy and a democratic society in Albania – these Scholarships and Internships are designed for young and mid-career professionals who are committed to meet the challenges of the future, contributing to development of these fields upon their return. AADF announces the call for applications for “Master’s & Internship Program” (MIP)- Professional Internship Component. To find out more and to submit an application, please visit https://www.mip-aadf.org/apply_inter.html. Deadline for applications is March 15th, 2019, 17:00 am. AADF has partnered with American Councils for International Education to assist the selection process, identify the U.S graduate institutions for placement of fellows, assist fellows during their study program and monitor their academic progress in U.S. The program is co-funded by the Biberaj Foundation, based in the U.S. The 2019 application for the Master Degree Fellowship Program is open and will be available until 11:59 PM (CET) on July 31, 2018. AADF has opened a call for applications for the Master’s and Internship Program – Professional Internship Component. Due to high interest, the deadline for application has been extended to May 31st, 2018. AADF Co-CEO, Mr. Martin Mata’s interview at ABC News about MIP – Professional Internship Component. 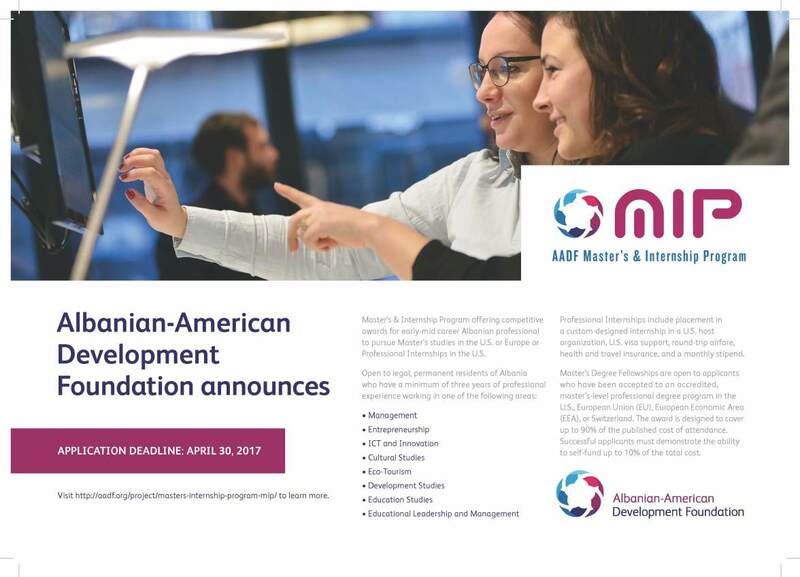 April 16, 2018, TIRANA – The Albanian-American Development Foundations opens the Call for Applications for the “Master’s & Internship Program” (MIP)- Professional Internship Component, which is a 5-year project which aims to empower Albanian professionals, from public and private sectors, working in the fields of Education Studies, Education Leadership and Management, ICT and Innovation, Project Management, Entrepreneurship, Business and Management Studies, Innovation and Development, Cultural Tourism and Eco-Tourism. Provides guidance and coaching upon return for each fellow to facilitate the implementation of their new skills gained during the internship program. The Application becomes available today at 18:00 until May 18, 2018. Deputy Prime Minister, Mrs. Senida Mesi and AADF Co-CEOs Mr. Martin Mata & Mr. Aleksander Sarapuli signed a Memorandum of Understanding to ensure government support with the implementation of the Professional Internship component of MIP. The purpose of this Memorandum is to enable government employees/civil servants to apply for professional internship program and ensure selected fellows return to the same job positions upon return, as a critical prerequisite for the effective implementation of the program. This is a 5-year program and aims to empower Albanian professionals, from public and private sectors, working in the fields of Education Studies, Education Leadership and Management, ICT and Innovation, Project Management, Entrepreneurship, Business and Management Studies, Innovation and Development, Cultural Tourism and Eco-Tourism. 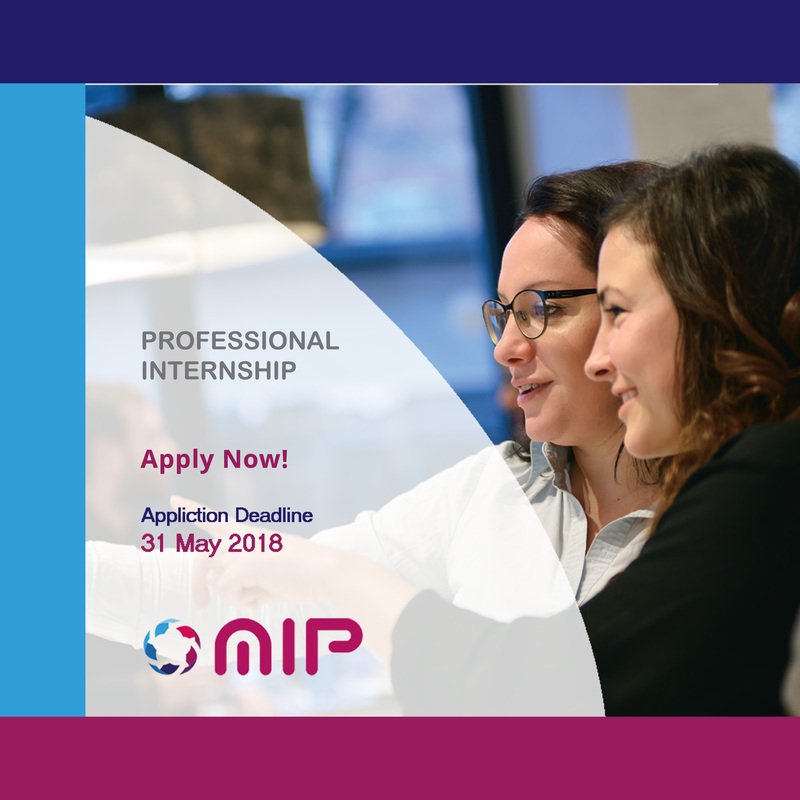 Following the implementation of a pilot year, next call for applications for Professional Internship opens in will be on April 16th, 2018. MIP will open the new calls for master programs and professional internships in the U.S in early Spring of 2018. The current website of MIP will be updated with latest information on the new application process and deadlines. We encourage you to visit AADF and MIP’s websites regularly. Entrepreneurship, Management, ICT and Innovation, Culture & Eco-Tourism, Development, Educational Leadership and Management.